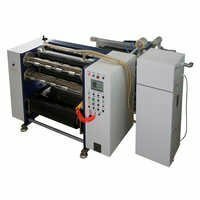 We are a renowned name, promised in displaying our valuable benefactors an unrivaled quality assortment of Automatic TTR Slitterribbon Saving. These items are planned utilizing ideal evaluation crude material and howdy tech innovation in harmonization with worldwide rules. So as to affirm quality, the complete assortment is altogether analyzed on various limitations by quality examiners. Keeping in notification the varying necessities of our supporters, we give these items in various stipulations at cheap rates. The machine has a compact design with fine finishing. It has a longer shelf-life with extended warranty. The machine is corrosion resistant. The machine is fabricated with accurate dimensions. It is easy to maintain with longer service life.